For the first time in quite some time my pull list was quite short. Only three titles caught my attention this week and it leaves me wondering if I should branch out and add some new titles to my reading list. Budget and time issues aside, I think I need some suggestions as to what to read. Feel free to leave a comment in the article or offer some suggestions via Twitter at @newhousebailey. 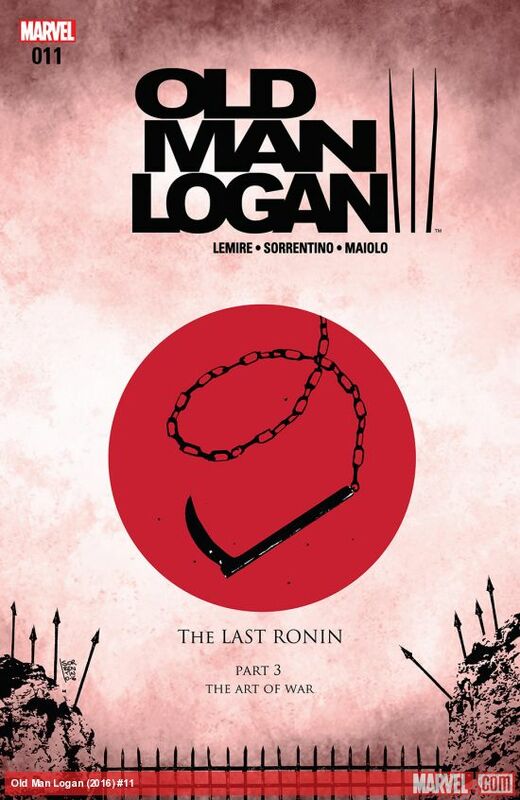 Old Man Logan #11 - This week's issue almost brings things full circle for Logan. After escaping the trap set forth by the Silent Order, Logan must once again defeat Sohei, someone he defeated in his previous life. In order to juxtapose the two battles, artist Andrea Sorrentino and color artist Marvelo Maiolo steal the spotlight from Jeff Lemire. His writing has brought us to this moment, but the use of contrast and color in the two-page spreads do a masterful job of telling us these two stories simultaneously. I think because I am so used to Lemire's art accompanying his storytelling that I have somehow overlooked the beautiful job that Sorrentino and Maiolo have been doing. Time to backtrack and look at the previous 10 issues with a more astute eye. All-Star Batman #2 - It looks like if I desire to stick with a Scott Snyder Batman I will be good to go with this series. This issue feels like a Quintin Tarantino. Snyder messes with the timeline, introduces us to a series of villains with flashy graphics, and is just fun. While we have to wait until next issue to find out why Bruce is being investigated, we get the pleasure of watching him use a variety of gadgets to take down a string of super villains as he pursues Two-Face on a speeding train. That alone is worth the price of admission. One thing I feel Snyder has always done an exceptional job with is introducing and utilizing a good number of villains. While some of their appearances may be brief, the manner in which they are introduced and disposed of is quite satisfying. Stray Bullets #18 - It's been too long since I revisited David Lapham's Stray Bullets. Lapham normally shares a story about drug dealers and some of the consequences of surrounding yourself with the wrong scene. Often it depicts how it impacts families, children, and friends. This issue was a bizarre story involving diet pills, past criminal lives, and corrupt doctors. While it didn't capture my attention like some of his previous entries, there is something oddly appealing about watching some of his characters see their lives unravel before their eyes.